Health is the real wealth and everyone wants to look fitter and younger. For work reasons, I was out of home last year and lived mostly on junk food due to which I gained weight. So this new year, my resolution is to lose weight by following right diet and exercising. I tried and tested a lot of food & nutrition apps and this article is about four such apps which I found to be best. All these apps are free and are available for Android phones and iPhones. Continue reading to know their reviews. This app is one of the simplest and most user friendly apps. It first asks you to enter your height, age, gender, current weight, the number of kgs you want to lose and accordingly suggests the maximum calorie intake you should maintain every day. 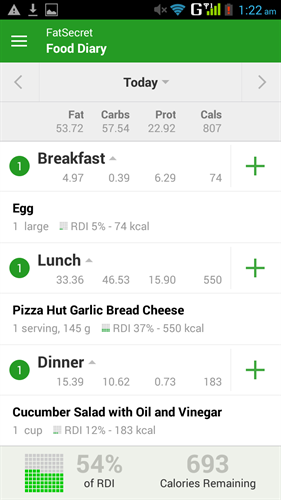 You can maintain a food diary wherein you can log your meals and the app will show calories and nutrients in them. It will show how many calories you have had and how many more you can have in the day so that you make appropriate food choices. The food database is huge and most of the Indian regional dishes are available in it. Interestingly, even menus of popular restaurants and food chains are available here. I was thrilled to find all pizzas of Pizza Hut as I order them regularly. You can also add a new food item in the database by scanning product barcode. The scanner gives nutritional information of any food. The only thing I would complain about is that unlike other similar apps, FatSecret has no 'Favorite foods', 'Latest searches' or 'Recent meals' option to make the process faster and one needs to scroll down again each time to enter regular meals. Similarly, Exercise database is also available covering popular activities like running, push-ups,weight lifting and even resting & sleeping. 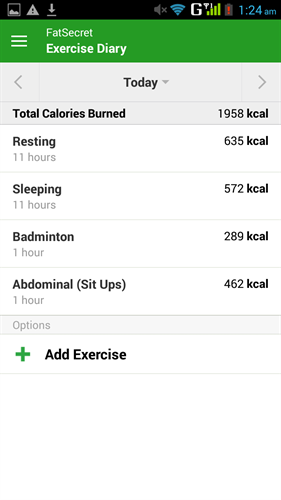 You can also add your own activity to it and keep a track of the calories burned each day. 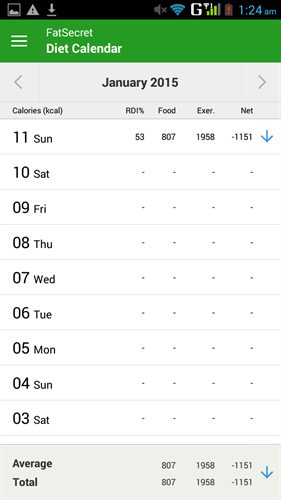 The app generates a monthly summary view showing daily calories input/output and the total average for the month. This gives you a big-picture and let's you know how you are progressing. There is also an online community where users can make new friends, participate in challenges, keep online journal and share experiences. The app interface is very simple but it supports ads and there is no paid version to get rid of these. 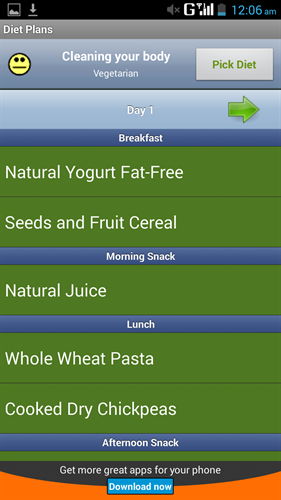 This impressive app has more than 130 diet plans. Diets are categorized into various sections including Blood group diet (a popular concept these days), Low cholesterol diet, Detox diet and Dukan diet. As per your physical profile (height, weight, etc), it picks a best suited plan which you can avail by signing up. I liked these diet plans which are an easy way to lose 2-4kg per month. Each plan is usually 14 day long and is to be repeated after two weeks. The forum is also nice and gives special significance to new moms willing to lose weight after pregnancy. My cousin is also a new mom and due to some health issues, she can't exercise much at the moment but through guidance from other new moms in this forum, she has lost considerable amount of weight. Wow! Another interesting feature in this app is that it allows you to calculate your Basic Metabolic Rate (BMR), i.e. the amount of energy needed to be able to sustain vital functions. Calculate the energy needed on a daily basis to maintain a set body weight and this can be very helpful in planning a long term diet chart. 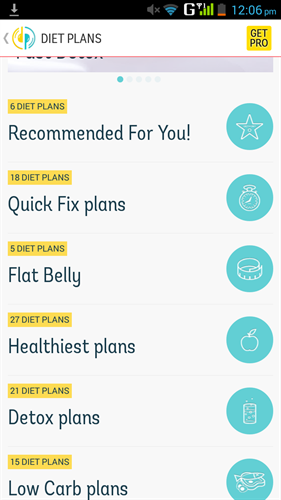 Though this free app in itself is very useful, if you want additional features like automated shopping lists for diet plans, forum alerts and meal reminders, you can buy the ad-free PRO version for a monthly fee of Rs.610. 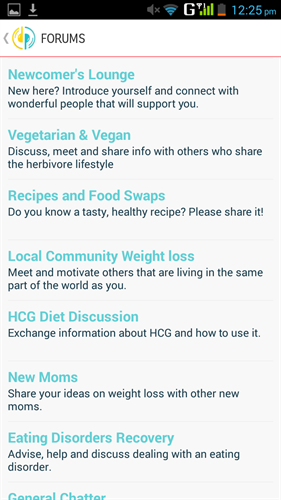 This app offers diet plans designed for every taste and need. For example, you get diet plans for losing weight, gaining weight, cleaning body and even for cheering your mood. You can also add your own diet plan. Upon tapping on any diet plan, a seven day long food routine appears on screen starting from day 1. I loved these diet plans because the food components are not just nourishing but also hunger- satisfying. Five time meal is usually suggested in all plans. 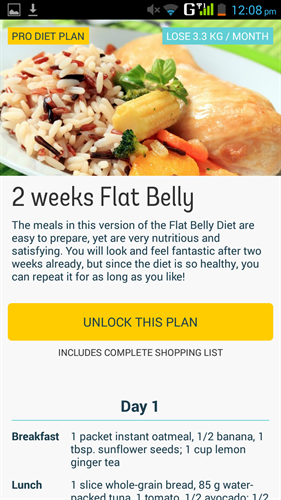 Some users may feel that these plans leave you starving but as I have consulted a dietician before, I feel that these are better than the ones given by her and so I appreciate this app more. The app is so simple and easy to use. It supports ads but they are completely unobtrusive and do not affect user experience. Still if you want to download an ad-free version, you will have to pay $0.99. There is an integrated weight chart which graphically displays weight loss progress. You can share this information with your friends via Google Docs, Dropbox, Gmail or Facebook. 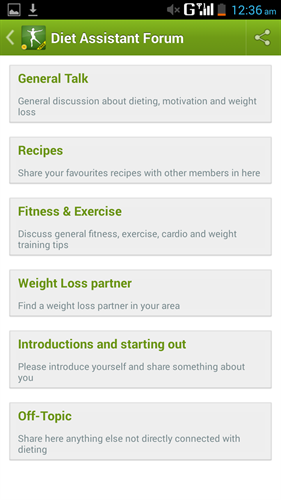 You can also socialize with other app users via Diet Assistant Forum wherein you can share recipes, weight loss tricks & your experiences. I found some really interesting recipes here. Members are very welcoming and helpful. This app gains relevance as the word 'Superfoods' has become a buzz in recent years. Everyone is talking about foods that speed metabolism, aid weight loss, cure diseases or stop premature aging but there is a lot of confusion. Most of us still don't know all these foods and the right quantity or the right way to incorporate them into our diet. 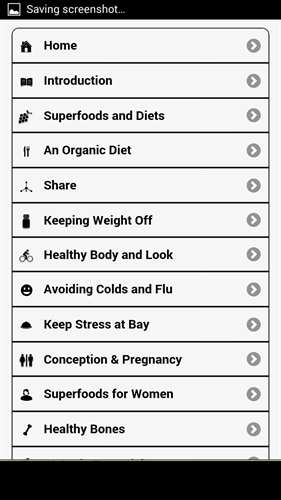 This app acts as a library with health related mini articles and can be called a one stop solution to all your queries. It suggests foods & remedies to avoid cold, lose weight, look good and other purposes. I learnt some very interesting information via this app and am happy that I downloaded it. If you love to read, you would love this app. Of all these apps, my pick is MyFitnessPal. It is really an excellent app in its genre and best thing is it is FREE! One more thing I like about this app is that it has the largest ever food database.